Dental scaling and root planing is a special type of cleaning that is necessary for people with symptoms of gum disease. 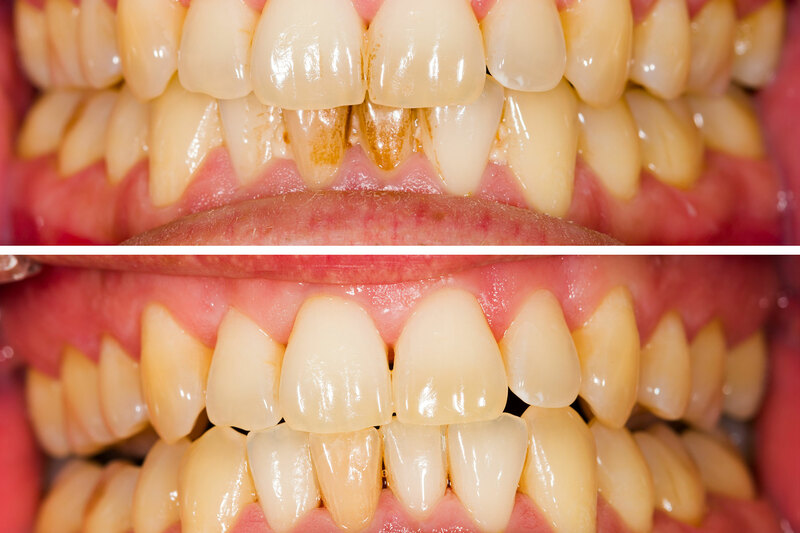 We recommend dental scaling and root planing to non-surgically treat periodontal disease. Dental scaling and root planing is considered the “gold standard” for treating periodontitis according to the Journal of Evidenced-Based Dental Practice. Dental scaling and root planing may take more than one appointment. This procedure involves thoroughly removing plaque, toxins, and tartar deposits from the exterior of your teeth and roots. Root planing is the smoothing of all rough areas of your root’s surfaces. This will help keep bacteria and plaque from reattaching underneath your gumline. More advanced periodontal conditions may require surgery to stop bone loss. After your procedure, we will meet with you as a follow-up. We will check the healing process of your gums and of your pockets. In the majority of cases, swollen or irritated gum tissue will become firm and pink again. Bleeding will be reduced or eliminated and your pockets will get smaller. When we verify that your gum tissue has responded well and remains stable, We will verify if any further treatment is needed. After a procedure such as dental scaling and root planing, we highly recommend setting up subsequent checkups to make sure that your gums are not further receding and no other damage is occurring. In some cases, more advanced periodontal conditions may exist. These may require surgery after root planing and scaling to stop the progression of bone loss. Scaling and root planing treatment often lowers the likelihood of surgery needed. It is better to come in and get checked earlier rather than later to try to prevent any surgery that may be needed. Call us to learn how South Gables Dental can help you or make a dental appointment today at our Coral Gables office!